Oh I just love the Book of Acts so much! It stirs my soul to act and to share! 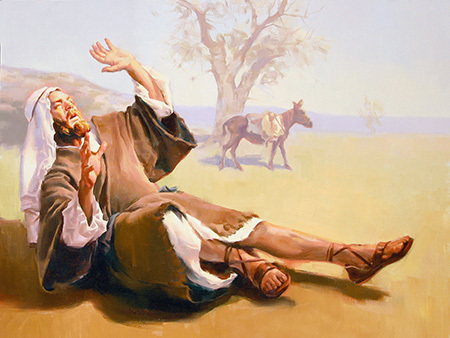 Every time I read Acts Chapter 9 I like to try to place myself in Saul’s shoes. Reading it this time, I was so blessed to be able to discuss Saul’s conversion with my sweet hubby, Ron. The excitement was thick in the air as the Holy Spirit moved and we talked about how Jesus spoke to Saul and what Saul must have experienced and what thoughts must have went through his mind when Jesus spoke to him and chose him to do His work in the early church. We shared how we would think and react if it were us. SIDE NOTE: Let me tell you ladies, if you and your soul mate are not sharing time together in God’s Word, you are truly missing out on one of God’s greatest blessings! As we grow together in our walk with our Saviour, it not only draws us closer to our Lord, but closer to each other in our marriage relationship as well. After Jesus, my Honey Bunny is my very best friend. There is nothing like it on this earth! But isn’t that what God’s Word says it should be – Genesis 2:22-24 “And the rib, which the LORD God had taken from man, made he a woman, and brought her unto the man. And Adam said, This is now bone of my bones, and flesh of my flesh: she shall be called Woman, because she was taken out of Man. Therefore shall a man leave his father and his mother, (and dare I say, his family? Are we to abandon our families? Of course not, but the husband and wife are now one, and each will definitely and rightfully take precedence over the rest of the family.) and shall cleave unto his wife: and they shall be one flesh.” And in Ephesians 5:31 “For this cause shall a man leave his father and mother, and shall be joined unto his wife, and they two shall be one flesh.” Sometimes we women think we need other women, we like to call our besties, to talk to who ‘understand’ when we need to vent or rant and won’t judge us. I have learned the truth to be that more times than not, that is an excuse for women to meet and gossip and say hurtful things about others behind their backs, and justify it by saying we just need to vent. When we have aught against another, we are to take it to that person or leave it up to the Lord, whichever He leads us to do. If we are blessed to be married to a man who is a truly Godly man, he will call us on our back-biting and offer to pray with us for God’s direction in the matter, and support us in doing the right thing. And, of course, it does go both ways. Okay, so I must needs get back to the point at hand. 😉 I just had to share what God is teaching me in this matter, and what a blessing God gives us when we place our husbands at the head of our homes as God intends and allow His Holy Spirit to mingle in both our spirits together. So, in Acts Chapters 6-8, we read how Stephen, filled with the Holy Ghost preached truth to the religious leaders and he became the first disciple to die for the cause of Christ. Saul first shows up in Acts Chapter 8:1 tells us that “And Saul consenting unto his death…” What a truly powerful testimony Saul/Paul had to lead lost souls to Christ! And each one of us who has been saved from hell by the sacrifice Jesus gave on the cross has a testimony to do the same. Telling others what Jesus has done for us is the best way to win souls to the Saviour! 5 And he said, Who art thou, Lord? (Saul called Him Lord. He must have thought, “This is surely the one and only Supreme God of Heaven!”) And the Lord said, I am Jesus whom thou persecutest: it is hard for thee to kick against the pricks.